Not too long ago I shared with you that my art class was making lanterns out of wide mouth quart canning jars. (See post here Living with Art – Painting on Glass) Today I would like to share a pattern with you so that you can make your own lanterns and more. I began painting with DecoArt Gloss Enamels. Note: following manufacturer guidelines for prepping surface. I painted the trunks Honey Brown, the palms Foliage Green, and the rim of the jar Bright Orange. I allowed it to thoroughly dry and then gave the trunk and rim a second coat. I then floated on one side of the trunk and made cross lines with Dark Chocolate. For the second coat on the palms I used Citron Green and Festive Green. On the rim I put Royal Fuchsia checks and a wavy Desert Turquoise line around the bottom. I used a dabbler and White for the dots. Cut two pieces of wire about 8” longer than distance around rim. Place wire at right angle to each other with one piece on outside. With 4” of wire extended beyond inside wire, wrap outside wire twice around inside wire on both sides. Place inside wire under rim of jar, and pull tight. Twist to secure. If desired, place beads or bells on end of wires. Fold all wires over with needle nose pliers. Wrap wire around paint brush handle to curl. I also made coordinating glasses and a tray. I used the same colors for the glasses and on the tray I used coordinating DecoArt Americana colors. Here is the pattern for the glasses Palm Tree Glasses Pattern (PDF) I used the same pattern for the palms on the tray. Remember to heat set your drinking glasses and hand wash. The lanterns can be fun to hang in a tree. You can use a little sand and a votive in the bottom or battery operated candles. Here are my lanterns flickering in the trees. I love that you can hear the birds in the background. 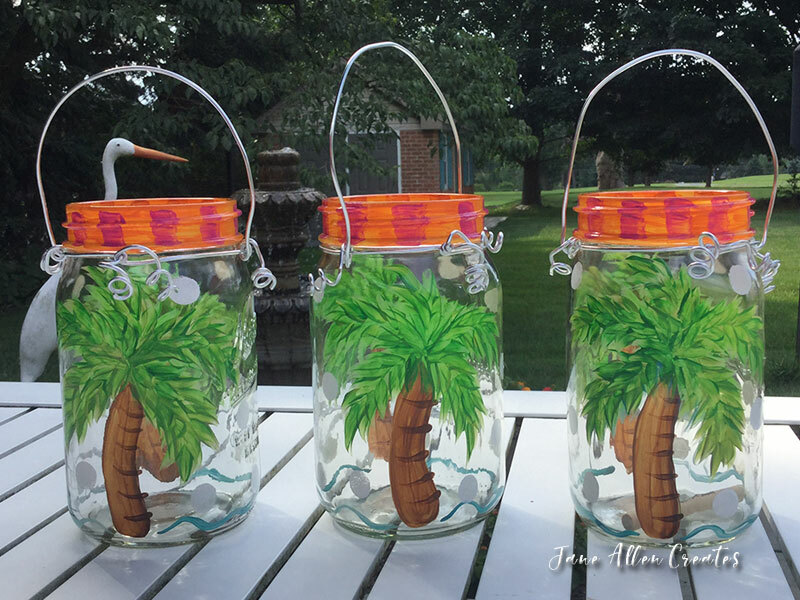 I hope that you will enjoy painting these palm tree lanterns. Let me know some of the creative ways that you use it. Thanks Jane..these are so cute! Thank you for sharing! Completely adorable…Maybe something I can share with teens in Bible School. Thank you Marilyn, I would love to see their results if you decide to do the project. Thank you Heidi, I am also a tropical girl. The bird in the background is a carved white heron. We bought it at a gallery in Sanibel about 10 years ago. I also like Flamingos, I hope to be painting more of them.